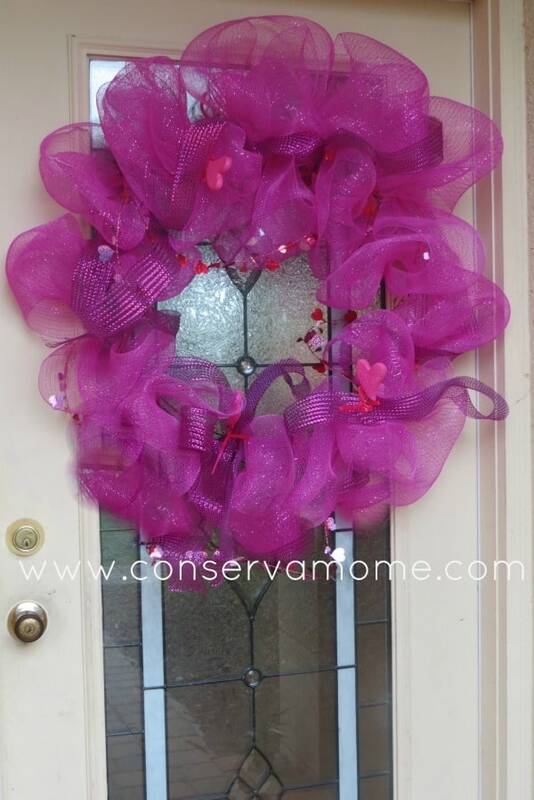 This fun and easy valentine’s day wreath will be the perfect addition to any Valentine’s day decor. Check out the easy instructions below! 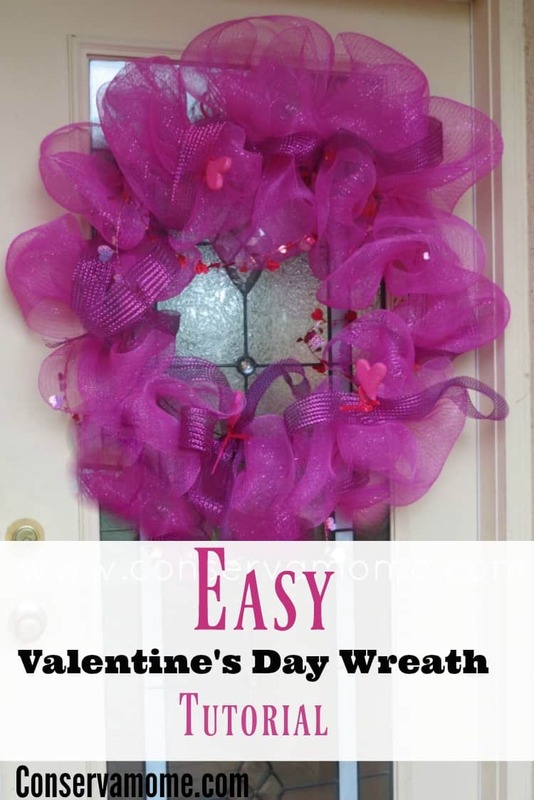 Everyone loves a fun wreath, what better way than to embellish your home than to make your own Easy Valentine’s day wreath. 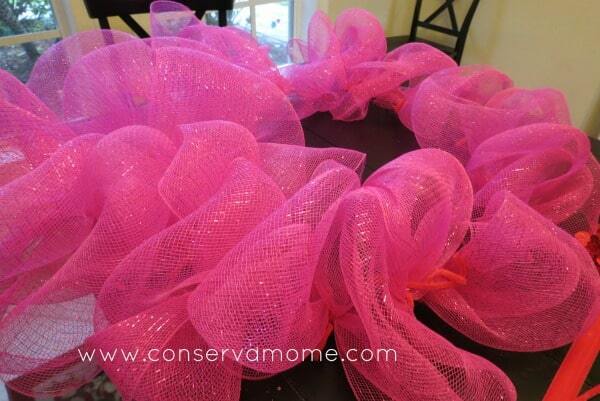 I couldn’t believe how easy this wreath is to make and how forgiving it can be to make. 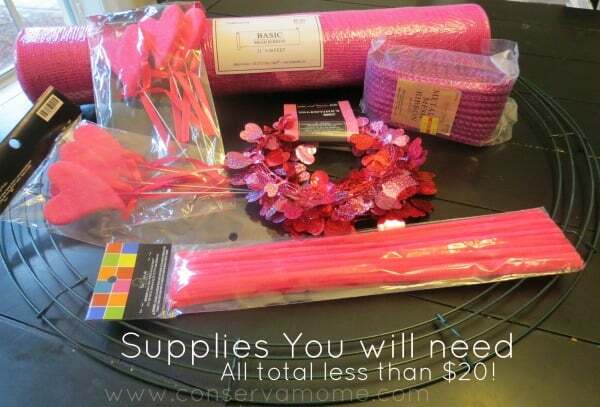 It doesn’t take an expert crafter to make this project and it’s incredibly inexpensive to make. The basics you will need are a wire wreath base which you can find at any local Hobby lobby, Micheal’s or similar craft store. 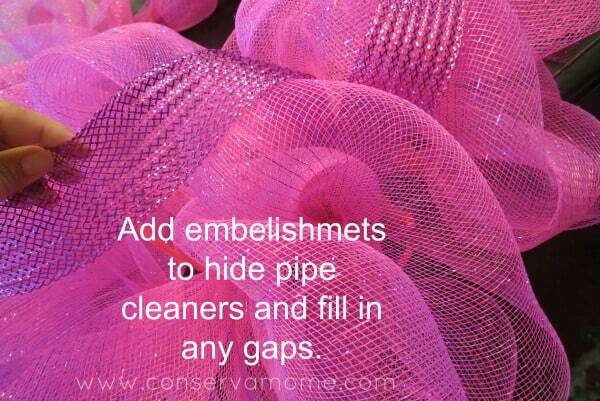 A large Mesh Ribbon role of your favorite color (or colors) although you can get away with making it with just one role, 2 will make it even fuller so it’s up to you what look you are going for. 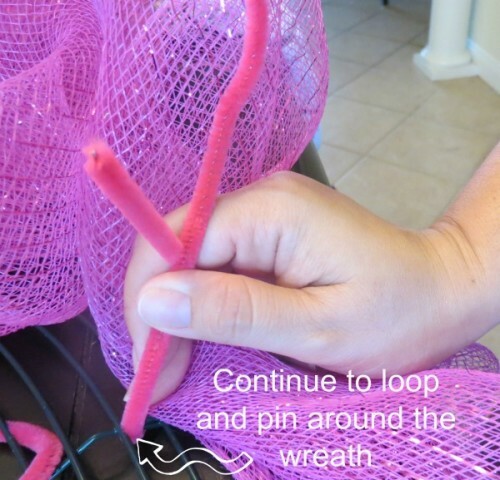 Pipe cleaners to hold the ribbon in place. 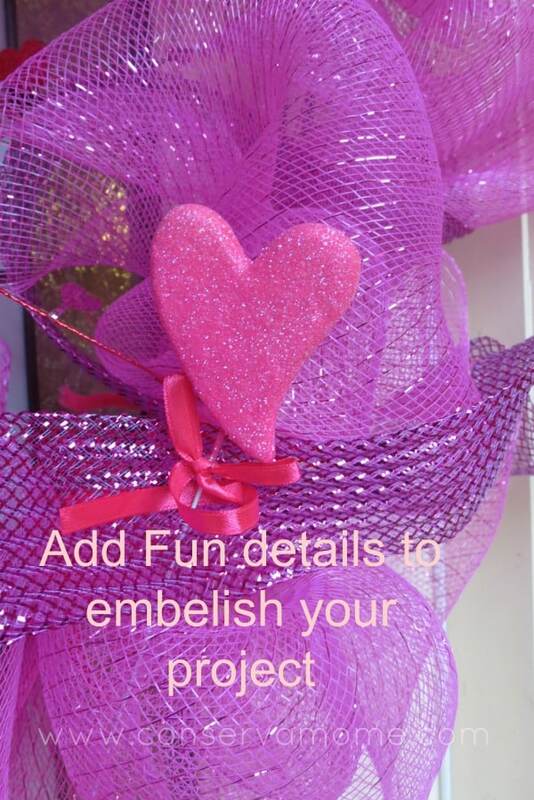 Finally any embellishments you want to add like ribbon, and different decor to put on wreath. You can put as much or as little as you like. I went with a smaller Mesh ribbon for detail and some heart sticks to place randomly around and of course a heart garland. Everything I bought ended up costing less than $20. ( I had a Coupon from Hobby Lobby and the Valentine’s Decor was on sale) However, most craft stores always offer some sort of discount so keep your eyes open. To begin (and for the rest of the project) you will put a pipe cleaner on top and on the bottom. Like in the picture. 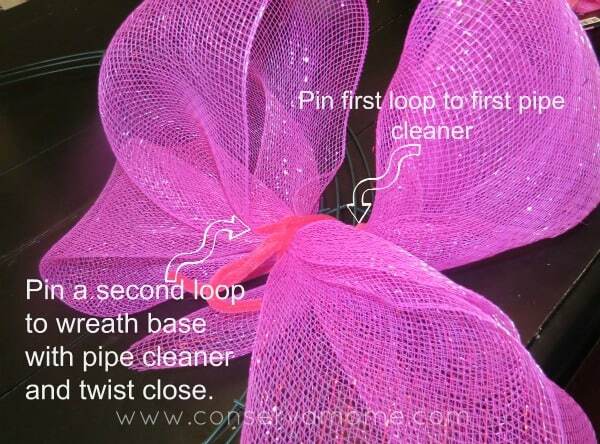 You will use this to pin the Large mesh ribbon in place. Simply scoop up like I did below and pin into almost a loop. You begin with the first piece and then do the bottom. You will continue to do this all around. No cutting, no sewing and no glue. 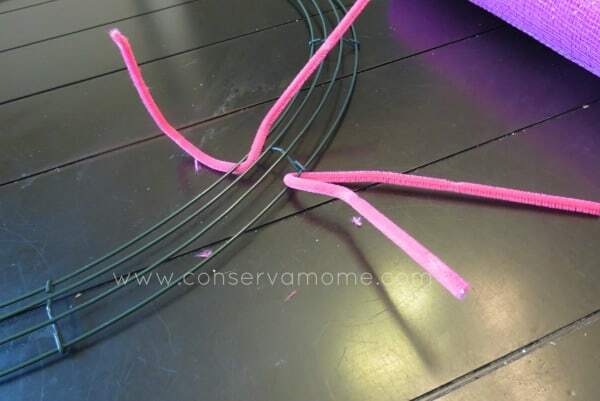 Just use the pipe cleaners to pin each loop in place. You will continue through the rest of the wreath pinning at the top and at the bottom. Just grabbing a little bunch at a time and pinning it in place. You will go around the whole wreath creating a bunched look. This material is very forgiving so even if you get some sides bigger than others you can manually move it around to spread out the way you want it to. 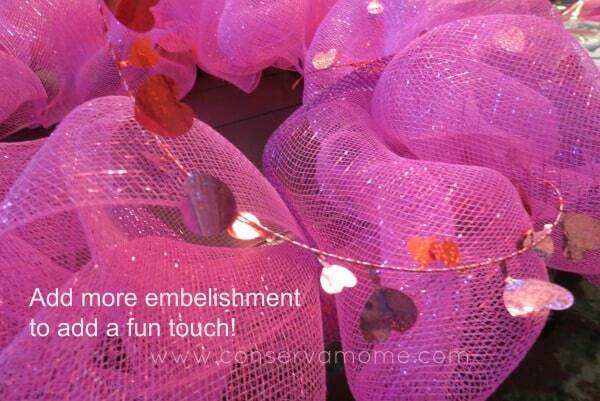 After you have pinned all the pieces in place you can add embellishments. I added the mesh ribbon to help hide the pipe cleaners and any “bald” spots that may have occurred. After adding the ribbon you I added the garland just looping around. Because of the large Mesh ribbons pliability it all stays into place although you can secure the back with pipe cleaners for extra security. Final product is Valentine’s Ready! Like I said before this project is extremely forgiving and for even the most novice of crafters. It took me from start to finish about 20-30 minutes to complete. These are gorgeous to look at and retail for more than $60 so to be able to make one of these for less than $20 is a win/win in my book! Looks easy enough for me! Lol I’ll have to give it a try! Thanks! Amazing! And easy to redress for other times of the year! I love this! It looks so easy and you can change the colors and accents to reflect different seasons/ holidays. This is super cute. I’ve been looking for something to do with the plain burlap wreath I currently have. I could do something like this and add the little hearts to it and what not. Or even make it Easter thememed. So fun! My daughter is going to make this over the weekend!